INCONTINENCE is a difficult issue for caregivers and direct service providers. Making CLEAN UP EASY, preventing damage to patient skin and avoiding permanent furniture destruction is always a high priority. The contract furniture industry has recently given incontinence (and limited mobility) a lot of attention. Engineers and designers have interviewed hundreds of care providers and administrators to help create furnishing solutions for incontinence care. 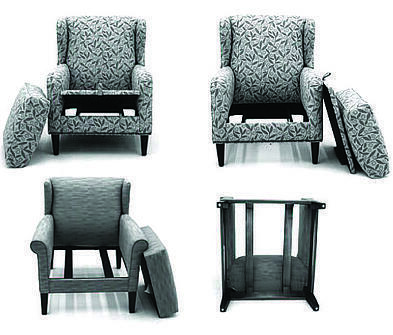 The results of this intensive research include improved design in furniture including removable seats designed to pull urine to the ground and away from people and furnishings, specialized fabrics that easily sanitize, fluid-proof upholstery, fully water-resistant frames that prevent fluid saturation and warping, and more sophisticated styling that scales down cushy fill and deep seats. One tried and true method of managing incontinence and general fluid spill issues is self deck upholstery. Savvy furniture buyers have been using self-decking for decades as a simple and cost-effective way to “catch” fluids and prevent damage to internal furniture components. The concept is simple – a piece of fabric that covers the entire area under seat cushions is tightly attached under loose seat cushions. This deck acts as a sort of reverse umbrella that catches and pools fluids into to allow for easy clean-up. Self decking for fluid concerns requires a fluid-resistant fabric, but inexpensive, solid color water-proof upholsteries are a readily available and are low-cost ways to make any new furniture last longer. Few retailers offer self-decking but almost all contract furniture providers do. Buyers for health care and social service facilities understand the importance of buying furniture from contract providers who understand the heavy use health care furniture endures. Contract furniture is built to higher standards that promise longer-term durability and proven improvements in the buying cycle. Strategies like using self deck upholstery are just one of many specialized solutions available only through expert contract furniture providers. When it’s time for your next furniture project make sure to ask your furniture seller what suggestions they have for your specific client and patient needs.